5 REASONS why I will not buy my child a fidget spinner!! Welcome to the worldwide craze for 2017. Suddenly, seemingly out of nowhere, comes the FIDGET SPINNER. It is a little spinning toy that is designed to give restless or anxious people (especially kids with ADHD!) something to fiddle with and is supposed to help them to relax. But rather unexpectedly, it has been adopted by the entire population! So does your child really need a fidget spinner? The modern day fidget spinners are too large and won’t spin if kept in your child’s pocket. 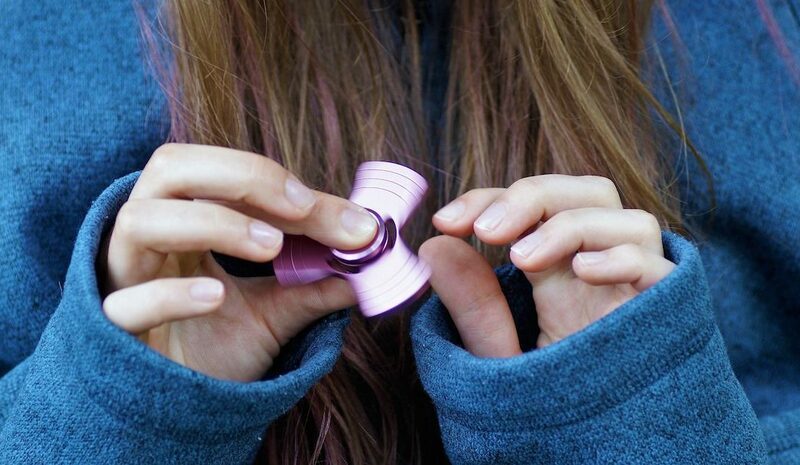 Fidget toys are designed to keep busy fingers active in such a way that no one will notice and the person can interact appropriately. A good fidget toy should be out of sight at all times. Many fidget spinners (especially the cheaper copies) make noise of varying intensity depending on the state of the bearing. This can be very distracting both to the child holding the toy and to those around him. Rather than fiddling with the toy out of sight, many children will hold the toy up to their ears so they can hear the changes in the noise of the spinner at various speeds. Whilst fun and interesting, this will not help them to concentrate in a classroom! 4) THERE IS NO EVIDENCE that the modern fidget spinners will help a child to concentrate. And, whilst they’re fun to spin, they can be highly distracting – both to the child playing and those sitting around him. In our current world of electronic stimulation, our children have very little opportunity to just sit and be. They feel the need to move constantly and prefer to over focus on a single toy / game and don’t appreciate the big picture. Our children would benefit far more if they put the electronics and the fidget spinners away and went outside. They should be riding bikes, climbing trees, building cubby houses and playing soccer with their mates. They are unable to do any of these things if they are holding a fidget spinner! No! My child DOES NOT NEED a fidget spinner! You may choose to buy one as a toy but it is not a helpful classroom tool. in fact, if I were a teacher, I would ban all fidget spinners from the classroom! I certainly ask the children to put them away during consultations because otherwise, everyone’s attention is on the fidget spinner instead of the child!! NOTE : If your child’s teacher is concerned about their concentration or behaviour in the classroom, there are many behavioural strategies that can be used to help an active child to sit in a classroom and improve their concentration. If you are concerned, you should talk to your child’s teacher and consider seeking a medical opinion if needed.